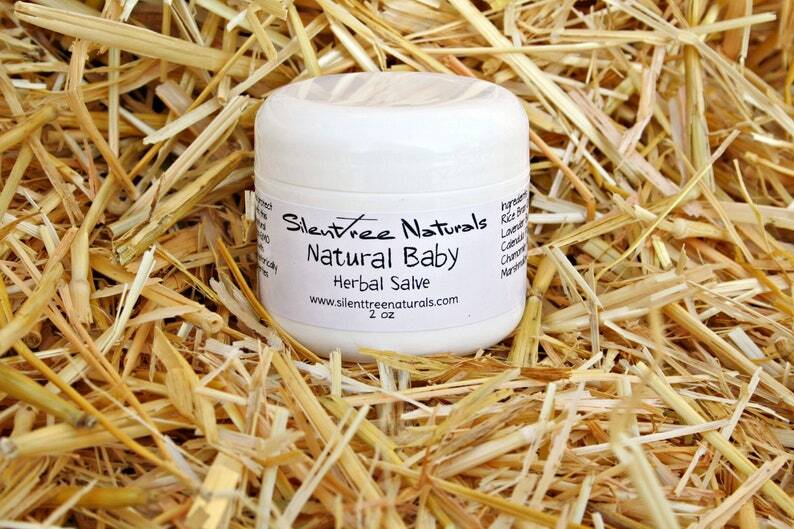 Soften, moisturize and protect Baby's delicate skin with this safe and soothing all-natural salve crafted from non-GMO Rice Bran Oil, infused with organic herbs, known historically for their calming properties. Lavender has been used for thousands of years to induce sleep and relaxation, but it is also an anti-inflammatory and antiseptic, which make it beneficial for soothing minor skin irritations. Calendula works to reduce inflammation and promote healing. It is antibacterial, antimicrobial, antiseptic, and antibiotic, so it’s wonderful for soothing inflammation, rashes and irritated skin. Chamomile is not only a great skin-soother, it's properties include anti-inflammatory, antibacterial, antiviral, antioxidant and analgesic, making Chamomile beneficial for not only calming redness and irritations, but for anxiety and mild insomnia, as well. Marshmallow root is an emollient which soothes, lubricates, softens and heals inflamed skin. We also have Natural Baby Herbal Oil sold separately or as a set...makes a wonderful shower gift!